Limited edition monster roadster gets a classic set of alloys. 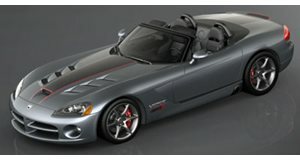 Dodge introduced the limited-edition Mamba edition package in 2004. Only 200 were produced, all featuring a two-tone black and red leather interior. Packing a 8.3-liter V10 rated at 500 hp and 525 lb-ft of torque, the SRT-10 roadster boasts a top speed of just under 190 mph, sprinting from 0-60 mph in 3.9 seconds. Strasse Forged Wheels got it hands on #141 of 200, and added a set of Performance Series S5 alloys, staggered 19/20 inches front/rear finished in Brushed Aluminum to match the Vapor Silver paint work.